Audi A8 Performance, Engine, Ride, Handling | What Car? In theory the A8 offers a choice of two turbocharged V6 engines, but the 335bhp 3.0-litre petrol (badged 55 TFSI) is temporarily off sale until it has been through the latest WLTP fuel tests. Currently that leaves the 3.0-litre diesel with 282bhp (badged 50 TDI). We're familiar with the brilliance of the 50TDI from the Q7 SUV and it remains just as brilliant in the A8; with 443lb ft of torque available from low in the rev range, performance is remarkably brisk and overtakes largely effortless. And don't think that being a diesel it'll be a noisy beast; the 50 TDI is free from vibration and relatively subdued even when pushed hard, so we'd rate it the pick of the range. But for those worried about the future implications of purchasing a diesel, the petrol makes a wholly convincing alternative. The 55 TFSI may not have quite the same amount of low-down grunt as the diesel, but it still feels perfectly suited to the A8. Its power delivery is buttery smooth and you barely hear any noise from it, especially when in Efficiency mode. Engage this and the engine turns off automatically when you lift off the accelerator at motorway speeds, allowing the car to enter a fuel-saving 'coasting' mode. This feature is enabled by the A8's 48V electric motor. It powers all the auxiliary functions, such as the air conditioning and power steering, and allows up to 40 seconds of coasting before the engine comes back online, entirely unnoticed. When you want to push on and utilise the petrol engine's performance, it revs more keenly and offers greater outright pace than the diesel, although the equivalent petrol in the Mercedes-Benz S500 is even more responsive and quicker still. Whichever engine you choose, you get a standard smooth-shifting eight-speed automatic gearbox. Of course, power is nothing without control, and the A8 is a long and relatively heavy car. However, Audi’s quattro four-wheel drive system comes as standard on all versions, providing supreme all-weather traction and reassurance that offers a distinct advantage over rear-wheel drive versions of the S-Class and BMW 7 Series. There’s also the option of four-wheel steering. 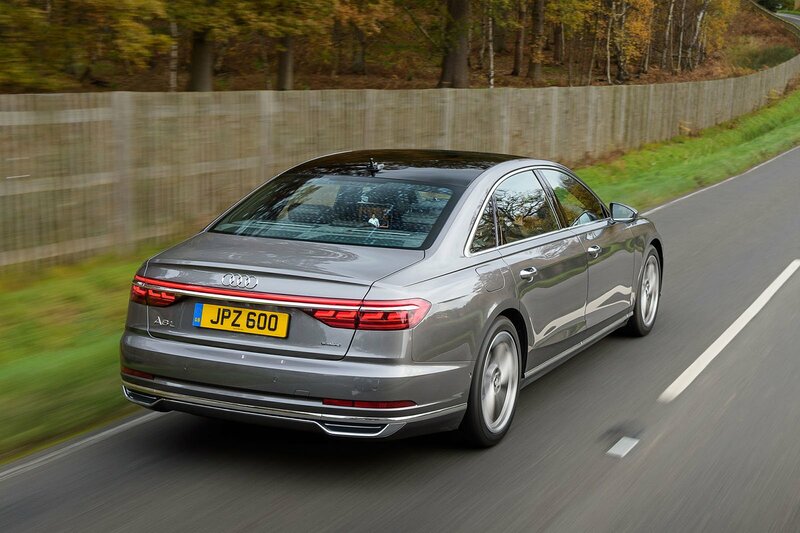 At low speeds this steers the rear wheels in the opposite direction to the fronts, improving manoeuvrability and making the A8 feel shorter than it is in tight spots, such as multi-storey car parks. A higher speeds, the wheels move in the same direction for greater stability when, for example, changing lanes on the motorway. 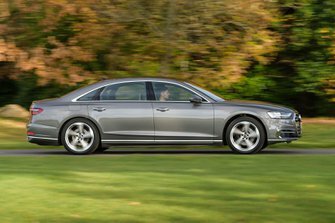 As a result, the A8 is just as able to fill you with confidence at high speeds as it is to keep you relaxed around town. While it is easy to drive and decidedly sure-footed, keen drivers will still find an S-Class or 7 Series more entertaining to pedal down a country lane. Press on and the A8's big body wallows more on its standard-fit air suspension than its two better-tied-down rivals. 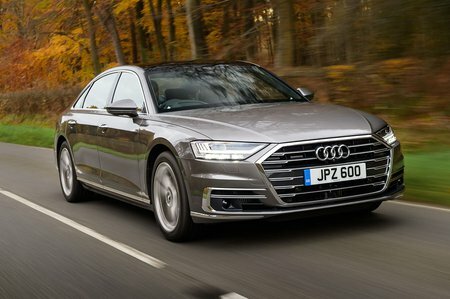 But, of course, pointy handling is not really what the big Audi is all about and the A8's softer bent has an important upside: it's not only the best-riding car in its class, it's also one of the best-riding cars full stop. It simply glides along any stretch of road seemingly untroubled by all but the most pronounced bumps. Whether you’re sitting in the front or the back, you’ll enjoy unparalleled levels of comfort. Granted, on 20in wheels the A8 lets in a hint of road noise over coarse surfaces, but wind noise is kept to a minimum at 70mph. If you want even greater separation from the outside world, you can option double-glazed side windows for a reasonable cost.